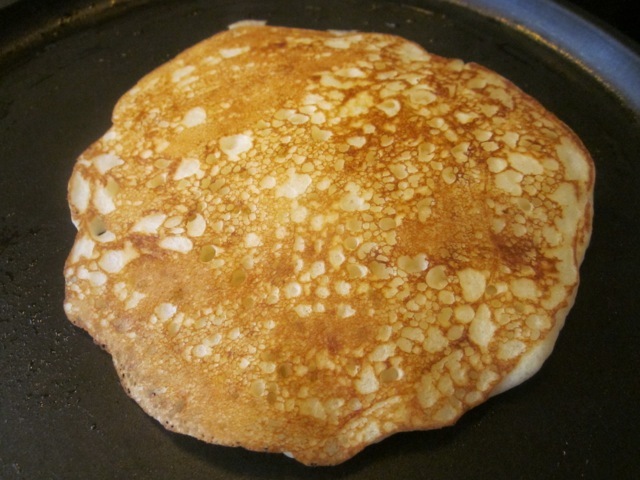 We had these pancakes for breakfast today and we absolutely loved them, so I decided to take photos and post the recipe. The original Gluten Free Recipe came from I need a Feed blog. I used all-purpose flour instead of gluten free flour; normal castor sugar instead of coconut palm sugar and normal baking powder instead of the gluten free one. I added ¼ cup more buttermilk than original recipe. 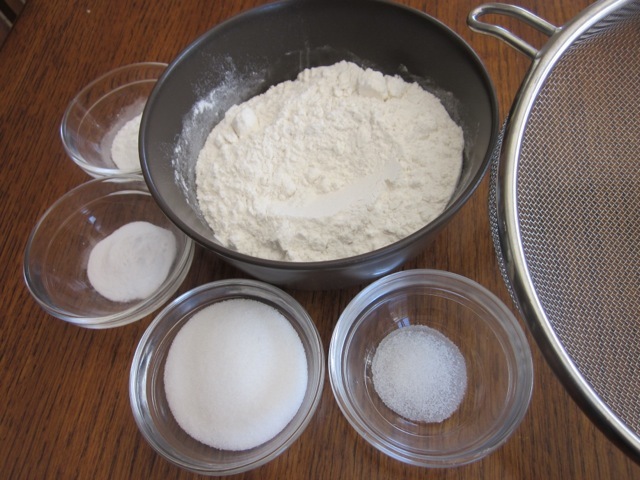 Sift the dry ingredients (flour, sugar, baking powder, baking soda and salt) into a mixing bowl and form a well in the centre. 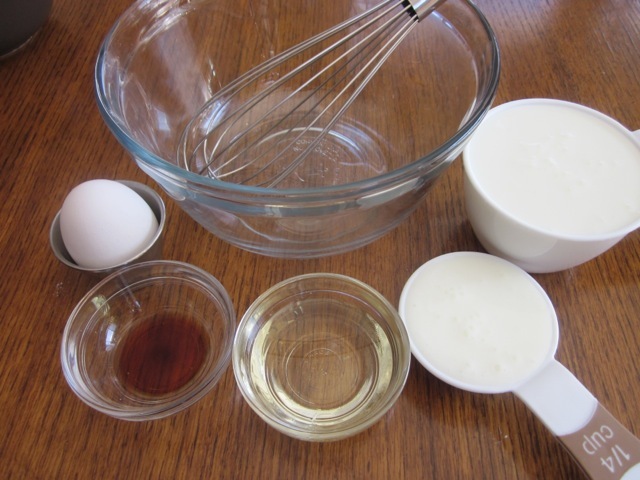 Combine buttermilk, olive oil, egg and vanilla essence in a separate bowl. Whisk to combine. and mix gently with a wooden spoon (do not over mix otherwise you’ll have tough pancakes-the mixture should look a little lumpy). If the batter looks too thick, add a little buttermilk, 1 teaspoon at a time. and butter or whatever pleases you. 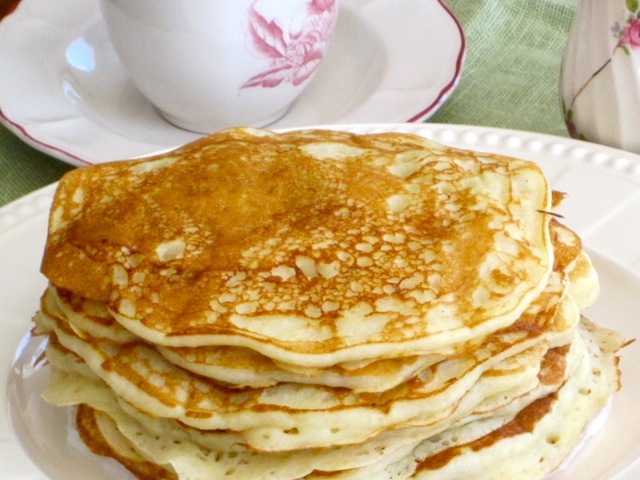 These pancakes are fluffy and delicious! 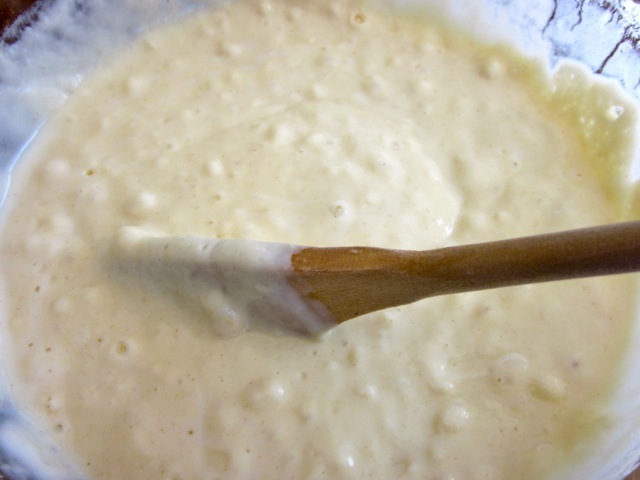 Pour the buttermilk mixture into the well and mix gently with a wooden spoon (do not over mix otherwise you’ll have tough pancakes-the mixture should look a little lumpy). 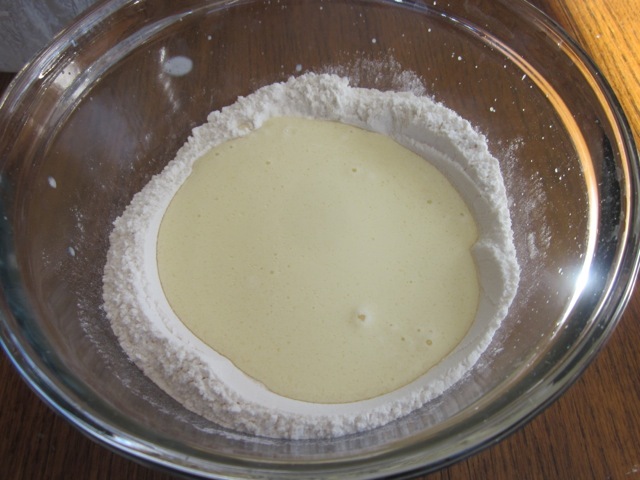 If the batter looks too thick, add a little buttermilk, 1 teaspoon at a time. I have just seen them. Thanks so much for trying out the recipe. I hope your hubby loved them. Have a fabulous Sunday! I also want to try the half-whole wheat version. Thanks for sharing! 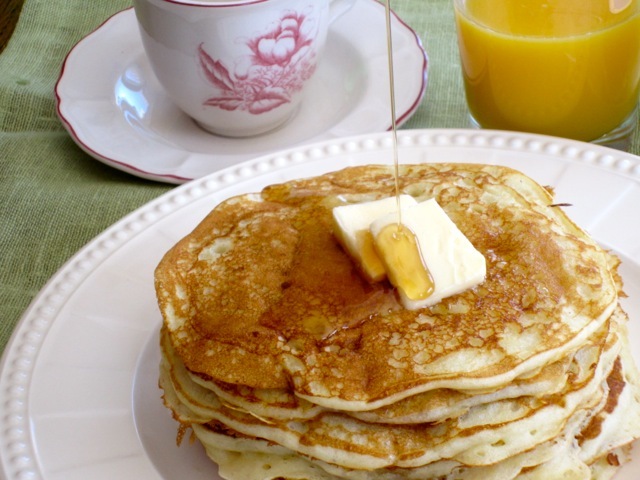 My daughter ALWAYS requests pancakes for breakfast, so it’s great to see another recipe out there! I try to make them slightly different from time to time so that we don’t get bored of them! Hi I bet it’s Belated New Year Greetings. I’m not sure I’ve seen you this year. I also love varying the recipes from time to time. People get tired of the same thing. Have a wonderful weekend. Sorry so long in commenting. These pancakes look wonderful. Yummm…. I can’t wait until Mr. Hubs is off his diet so I can make some of these for both of us. I hope Mr Hubs will be off his diet soon. Happy baking! Ha ha buttermilk does make a huge difference to pancakes. I just bought another litre of buttermilk….have a great weekend! I love them too. Those look divine! Thank you so much. Thank God It’s Friday. I hope you enjoy your weekend! I’ve just finished breakfast, then saw these….if they were presented to me right now I’d dive right in! Just call me miss Piggy when it comes to pancakes. Wonderful photos and I’m waiting to taste them!! Have a lovely weekend! I wish I knew when breakfast was, I could have mailed you some pancakes. I loved these ones. 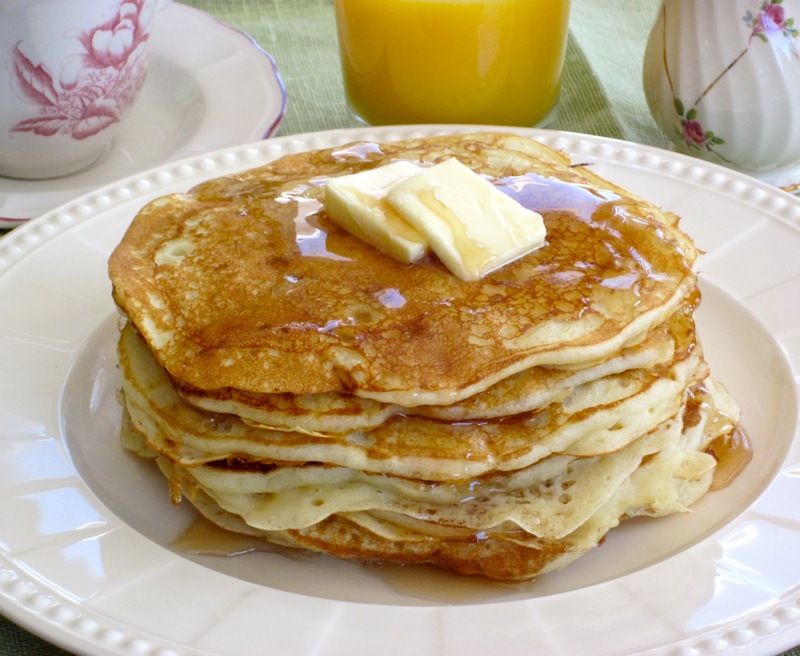 The buttermilk makes a huge difference: fluffy and soft and mmm..delicious! Thanks so much Sandy for your continued support. You are one of the most pleasant and amazing friend I ever met. I hope one day I’ll be able to see you in person. Best wishes to your family and friends. I look forward to posting more of your recipes in future.That bread of yours was a hit! Have a most wonderful weekend! Thank Ralph for the kind words. Can I mail you some pancakes??? Pleasant weekend to you! Hey I am keeping them flat, not rolling them. Please acknowledge receipt! Oh my! 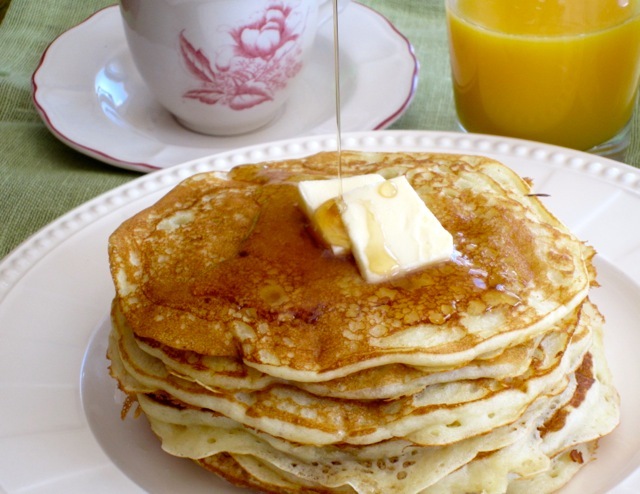 I just die for pancakes. And buttermilk ones? My absolutely favourites in the entire world!!!! I completely need to try this one. Thanks for sharing another awesome recipe, Liz. Ha ha and by the way your English is very proficient…I have learnt to be patient because I don’t want to do photography twice. It takes so much of my time I always just want to get it over and done with. My little monsters are not so little (13 and 15) so I can say wait and they wait…grudgingly of course but they wait. The photographs took me about 15 minutes, It was one of those miraculous days…I am hopeless with cameras, I just point and shoot. Thank God someone automated cameras. Thanks so much for visiting me. I love your website. One day I shall visit you and bake with you (God knows when!) Have a lovely weekend my dear! did piggy enjoy the pancakes? Hilarious. Thanks for making me laugh, Bacon. Best wishes! They look mouth watering and delicious! Oh, I am drooling on my computer screen again. Will need to wipe it with some tissue papers. Someone turn away the screen from me! 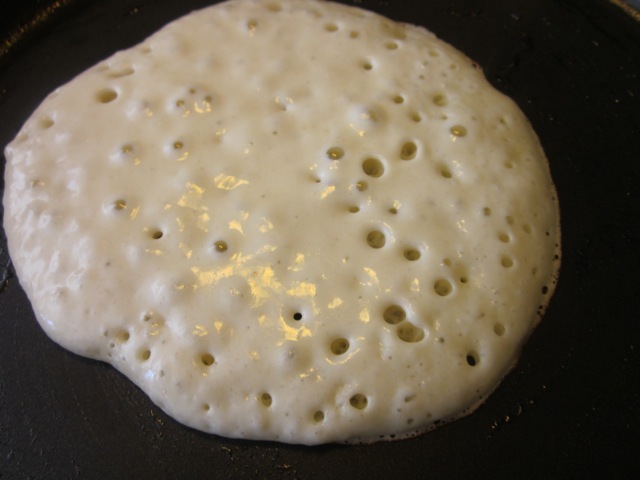 Oh, Pancake, come to me…! Hey Hari you gave me a good laugh. Food photos are addictive. I love food photos! I hope you’re having a great weekend. Best wishes! These look yummy. Great photos too! My kids certainly love pancake mornings. I meant to make some this week and didn’t get to it, maybe this weekend. Time for a double batch and freeze some for quick weekday breakfasts. Thank you. My kids love pancakes too and I love them even more. We enjoyed gobbling everything! Me too…I love pancakes. Have a brilliant weekend! Again, thank you so much for picking a recipe from my blog. Your pancakes look divine. 😀 Have a great day! They tasted fabulous. Thanks for posting and have a wonderful Friday! Beautiful pancakes, Liz! We eat pancakes for dinner sometimes and I think we are becoming overdue for a pancake dinner. This made me hungry for them! Oh yes savoury pancakes can be served for dinner. I used to eat pancake dinners and lunches in the Netherlands. They have great and huge pancakes over there. Thanks and have a lovely weekend! 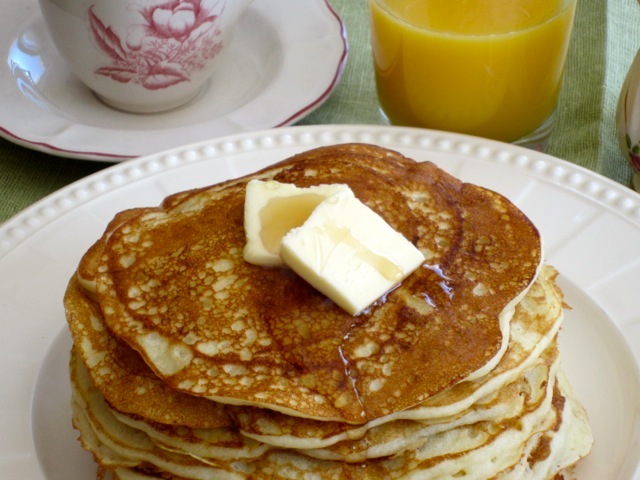 We have a couple of local restaurants that make some excellent buttermilk pancakes – but I’m going to give these I try & then I won’t have to leave the house to enjoy some light and fluffy buttermilk pancakes! I always seem to make my own pancakes because I can control what I add to them and they taste far much better. These ones are very light and fluffy and easy to make! Thank you! I wish you a happy Friday! I’ll have that! 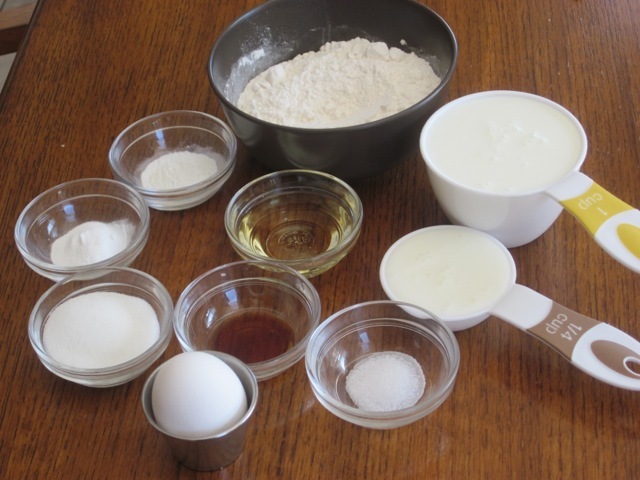 I read a big article once in Cook’s Illustrated about the reasoning behind using baking powder and baking soda when using buttermilk in pancakes. Apparently a little bit under or a little over with the baking soda, and you have a royal disaster. I am glad I didn’t have a royal disaster. The pancakes tasted good. Breakfast for dinner sounds very interesting. Swiss cheese omelette, that sounds delicious. I’m on my way to your blog to taste it right now. Virtual hugs to you! Oh yes I missed to see them. I shall stay tuned…I love cheese in omelette. Have a good night! I shall check out the pictures. I love omelettes. Have a fantastic Saturday! Thank you. I’ll be over in a jiffy…are you enjoying your Saturday? I bet you are! Good I ordered a while back…hope it’s coming soon! The cook is slaving over it at this very moment. Will you have coffee or tea with that? Mmm…coffee please with lots of milk and honey..or brown sugar, thank you! We have only coconut sugar, but it is ten times tastier than any other. Okay, so coconut sugar it shall be. I might buy myself some just to see how tasty it really is. have a goodnight! Oh Richard, thanks so much for the compliments. My daughter just gave me a big hug and a kiss, ha ha. The pancakes tasted really nice. My 13 year old son can eat the whole stack! Have a pleasant Friday! Thank you for loving the photo. I love it too!